But what became of Lenwë and his people? Was he the beginning of what is now known as the Silvan Elves? 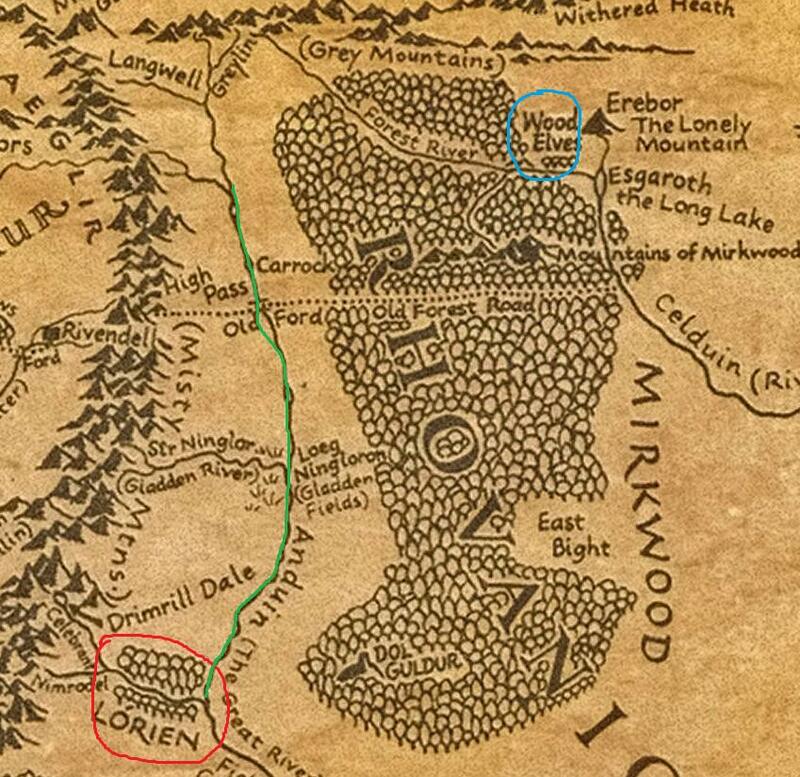 Does "southwards down the great river" mean Lorien? (Most of the Elves who dwelt in Lorien were Silvan Elves) Was Lenwë the leader of these people until Amdír (a Noldor) came and took over as King of the Silvan Elves. The Silvan Elves (Tawarwaith) were in origin Teleri, and so remoter kin of the Sindar, though even longer separated from them than the Teleri of Valinor. They were descended from those of the Teleri who, on the Great Journey, were daunted by the Misty Mountains and lingered in the Vale of Anduin, and so never reached Beleriand or the Sea. They were thus closer akin to the Nandor (otherwise called the Green-elves) of Ossiriand, who eventually crossed the mountains and came at last into Beleriand. Also, when was this reuniting of kin after "long years were past"? And were all Nandor who did not cross the Misty Mountains (such as Lenwë) then called Silvan Elves? The use of the word "became" is a bit misleading, though, because it's just another name for essentially the same group of people; it's a taxonomic distinction only. So in that sense, yes: all of the Nandor who never crossed into Beleriand became the Silvan, because that's how we define the word "Silvan." This is discussed in much greater detail over at Is there more than 1 species of elf in the Hobbit/LOTR saga?. The ultimate fate of Lenwë is not discussed, but it's likely that he eventually died; we know that some Silvan colonies (specifically those in Greenwood and Lothlórien) would be ruled by Sindar or Noldor in later Ages, and it seems odd that this would be required if the Silvan already had a perfectly good leadership structure. The history of the Elves is complicated enough from what we do know, and what we don't know is probably much greater. I agree that if Lenwe had survived the 1st Age he would cropped up in the history of the 2nd Age. Which begs three questions which we cannot answer. How did he die? Well we know Elves do not die of sickness, so that leaves accident or he was killed. If killed, who by:Elves, Men,Dwarves creatures of Melkor or wild beasts? Where did he die? Was it in Rhovanion, Gondor, Mordor perhaps or was he the leader of the Elves that made it into Eriador: after all passing down the Anduin the Nandor would have come to Calenardhon and could have by passed the Misty Mountains by the Gap of Rohan. When did he die? Before or after the return of the Noldor to Middle Earth? Which begs the question what was the role of Denethor. When was he born, before the turning aside of the Nandor or after? If before, did he always disagree with his father's actions and thus chose to cross into Beleriand when he could, probably after his father's death? Even if he did, not all the Nandor went with him. So what happened to the Nandor? Well, those that chose not to cross the Blue Mountains would have been spread across the lands of Rhovanion and Eriador. Unfortunately we know little of the peoples of these areas whether Elves or Men. It is likely that the wars of the 2nd Age would have driven those that remained into Greenwood the Great ruled from Amon Lanc with a satellite realm in what would become Lothlorien. The Elves of the White mountains would have dwindled slowly not becoming extinct until the haven at Edhellond ceased to be used. Which raises another point. We know that some of the Sindar sailed to Valinor from Edhellond, could some the Nandor or even Avari have done so. As for the nature of Silvan Elves, these could well have included some of the Avari. 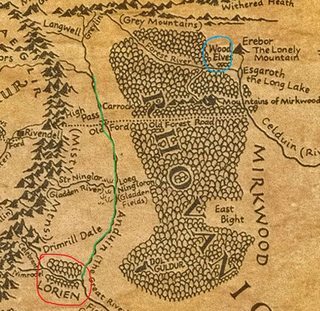 They may not have wanted to risk the journey to Valinor, but there is no reason to think that they did not spread away Cuvienen and some must have come west until they reached Greenwood. Unfortunately there are too many questions and too few answers. Who attacked the land of the Beornings during the war of the ring? Is there a more detailed description of the Battle of Dol Guldur?